Greece referendum: The standoff couldn’t have happened without the Internet. The Greek prime minister’s faceoff with Europe is something new: a bold, imperfect, high-velocity form of mass democracy made possible by the Internet. 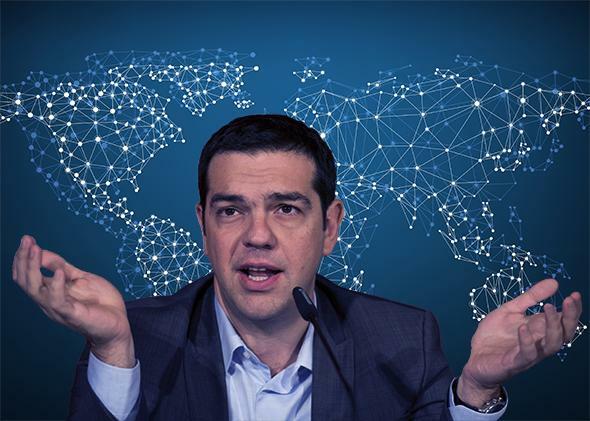 Greeck Prime Minister Alexis Tsipras is a first-of-his-kind digital demagogue. Illustration by Slate. Images by John Macdougall/Getty. Once again, negotiations between Greece and its creditors have stalled, and now a hastily called referendum set for Sunday raises the shocking possibility of Greece leaving the eurozone. * The eurogroup has been an unruly beast for a long time, yet most of its leaders, including Greece’s previous establishment governments, have never seriously raised the specter of leaving. Years of recession and sky-high unemployment in Greece resulted in the election earlier this year of Syriza, a defiantly radical left-wing party that was polling in the single digits a decade ago. But what’s occurring right now, as Greece does battle with the European Union over economic policy, its fate suddenly in the hands of voters, feels new for another reason: It is a bold, imperfect, and high-velocity form of mass democracy made possible only through the Internet. On-the-ground organizing got Syriza to where it is today. And Greeks will vote in the referendum—which asks them to accept or reject bailout terms made by the European Commission, European Central Bank, and International Monetary Fund and which many see as a test of Greece’s willingness to remain on the euro—in physical voting stations, not through their browsers. But in calling for a voter measure on such short notice and by using old and new media both to boost his populist prestige, Prime Minister Alexis Tsipras has done something notable: involved the population in what are typically elite, technocratic economic negotiations. To have a good chunk of the population tracking high-level economic policy so closely—even if not necessarily accurately—is a fairly radical shift. Call it real-time populism. Whether Tsipras is a bold contrarian or a foolish nihilist, his political approach heralds a new kind of digital democracy, one that’s as scary as it is revolutionary. Tsipras and Syriza have made use of the Internet to circumvent media intermediaries and exhort their supporters in far more direct ways than one might expect from a ruling party. Whether putting out daily YouTube videos or posting the creditors’ austerity demands online, Tsipras has aggressively pushed the impression that it is not just him but the Greek people themselves who are negotiating with the creditors. He has drawn on Twitter to bid for national and international support: “Our people have remained calm in face of blackmail,” he tweeted Monday. “Outside attempts to sway them only strengthens their resolve.” That fire-breathing didn’t let up this week even as he appeared to flinch, telling creditors that he is open to accepting a version of their terms: “After the #referendum was announced, better proposals were received- especially in regards to restructuring the debt,” he tweeted with a note of self-congratulation. Even if Tsipras is exaggerating in order to save face, it reveals Tsipras’ strategy of bolstering his negotiating position by invoking the weight of the Greek people, as well as appealing to international supporters. There have been many overblown accounts of the role Twitter and other Internet services played in Iranian, Egyptian, and other protest movements. While the Internet aided in coordination and information-sharing, there has been little evidence to suggest that there was a fundamental paradigm shift in those movements’ organization nor that the bulk of the work didn’t take place on the ground. In these movements, what happened on the Web was a partial and distorted reflection of the physical clashes between protesters and government. But Greece is different, because the conflict isn’t taking place in public. Rather, the conflict is an oblique set of negotiations playing out in multiple venues, and the most efficient way to share information about it is through the Internet. The stakes are unprecedentedly high for both Greece and the EU as a whole. Wolfgang Münchau wrote in the Financial Times that the referendum risks showing that “a monetary union without political union can only exist in violation of basic principles of democracy.” Tsipras is appealing to that fundamental power asymmetry here: Greece owes national debts, yet it does not autonomously control its currency, leaving its monetary policy in large part in the hands of Europe’s leaders. Tsipras’ objection is that Greece should not be forced to adopt further austerity measures when it has already been running a surplus, but on account of the euro, it cannot directly control its own monetary policy, through which it could devalue its currency to spur exports and growth. Imagine if, in the U.S. the Federal Reserve were really as unaccountable as conspiracy theorists think it is. It’s like that. Tsipras’ willingness and ability to call a referendum on an arcane (though incredibly consequential) process of debt negotiation is something that could not have happened without the Internet. The speed of information simply isn’t fast enough. It is unclear to what extent either Greeks or non-Greeks understand this information, but the speed and amount of political information being shared among the Greek populace is vastly greater than it could have been in the pre-Internet age, and for once that is making a definite difference. Even though Greece is less connected than most developed countries—only around half its population uses the Internet daily—Syriza’s base is in the unemployed youth, who are far more connected than Greece’s elderly. Moreover, Tsipras’ online strategy is international, relying both on appealing to leftist support outside his country as well as promoting the image of a population backing him. Calling a referendum to show one’s support is nothing new, but to call one abruptly in the middle of high-level economic crisis negotiations is. Tsipras is attempting to invoke “the people” for leverage at the snap of his fingers. It’s instructive to contrast this strategy with that of a very different leader in a similarly arcane economic negotiation: Barack Obama during the hammering out of the Affordable Care Act. Whether you think Obamacare is the 21st-century equivalent of the New Deal (rather hyperbolic) or the dawn of socialism in America (equally hyperbolic), most reasonable people would agree that it is a mess, a patchwork of overlapping systems and exchanges that was constructed to appease dozens of competing interests, from senators to insurance companies to state governments. Few Americans followed the negotiations, and unsurprisingly, few of these compromises favored the consumer. Obama couldn’t rely on 24-hour cable news to bolster or even to explain the negotiations, and he chose not to make use of the Internet to raise public support for his positions. Now, I have no idea if this would have even worked for Obamacare (Greece’s 60 percent youth unemployment is a bigger spur to action than anything Obama could have mustered), but Tsipras seems to have pulled it off and gained more political traction in the process. The creditors are aware that eyes are on them right now, giving a counterweight to the general anti-Greece sentiment in the Financial Times and elsewhere. If Tsipras loses the referendum, his government will most likely fall (for now), but this too seems to be part of the plan: It won’t be Syriza’s hands on the new round of austerity measures—it will be the Greek people’s. What’s new, then, is the degree of real-time visibility in these negotiations. In the U.S., look at the secrecy surrounding the hammering out of the Trans-Pacific Partnership, where draft documents are kept classified and congressional viewers are prohibited even from taking notes on it, all the better to hide such ideas as foreign companies being allowed to sue the United States. The last thing technocrats want is back-seat driving from a few hundred million people. This may be an understandable sentiment, but it’s an antidemocratic one, embracing the republican ideal of a government that represents the people while ignoring them most of the time. Tsipras, on the other hand, is appealing to the very core of the democratic urge. One might be tempted to see this real-time populism as a happy dawn of direct democracy, bringing with it both greater accountability and transparency. But if you’ve read your Thucydides, you know that direct democracy can lead to all the things Alexander Hamilton, James Madison, and John Jay talked about in The Federalist Papers, from public caprice to tyranny of the majority and worse. The Guardian’s Daniel Howden is already predicting doom for Greece on account of Tsipras’ antics, which he sees more as self-destruction than acts of populism. And even if you sympathize with Tsipras’ position, there’s no guarantee that a right-winger or even a neo-Nazi party like Greece’s Golden Dawn couldn’t bring the same tactics to bear during discussions of immigration or protectionist trade policy. The Internet is elevating populism both good and bad, and one consequence is an uptick in antidemocratic rhetoric from many elites, not just against Greece’s population but against unregulated and often repugnant outposts of vox populi like Reddit. For all the officiousness of the creditors, Tsipras’ strategy still carries with it significant risks, in spite of and because of its democratic idealism. The very forces supporting Tsipras could loudly turn on him tomorrow (or in the referendum), even as they put pressure on the creditors. Destabilizing populist forces could come into play. Tsipras wants to be the great Greek statesman Pericles. He may end up as the disastrous demagogue Alcibiades. *Correction, July 3, 2015: The article originally misstated that a referendum raises the possibility of Greece exiting the European Union. It risks a Greek exit from the eurozone.